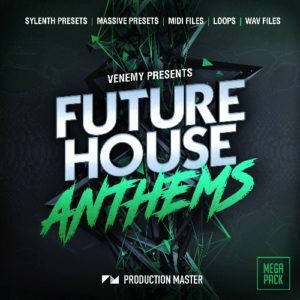 This Future House mega pack, produced by one of the industry’s top producers Venemy, features a versatile source of presets, sounds and loops. “Future House Anthems” can be useful for creating EDM, future house, and bass house. Ideal for music with crunchy and wobbly leads, dramatic beats, deep basslines featuring the uplifting house pianos we all love! “Future House Anthems” is a professional production toolbox. In this extensive library you will find every sound, hit, beat, effect you need to make chart-topping EDM / future house that will blow your fans off their feet. Filled to the brim with Venemy’s secret sounds, presets and drums, this mega pack is a serious force to be reckoned with! The full pack contains 103 NI Massive presets and 75 Sylenth presets – featuring; in your face basses, screeching leads, huge chords, deep growls, thick bass layers, stabs and much more. 100% ready to use in your mix! Furthermore, you get a plethora of 24Bit wav files – including: one-shots; sick synths, FX, handcrafted house pianos, bass sounds and over 100 high quality drum hits with kicks, claps, rides, cymbals, hihats, and blazin’ top loops! Lastly, we included various expert midi files and piano loops to kickstart your creativity. Grab your copy now and start to move on from making future house tunes to Future House ANTHEMS!